Time series of current profiles and pressure were obtained at three locations within the shoal complex associated to Cape Canaveral, Florida Atlantic inner-shelf, with the objective of determining the influence of tides in the surface gravity waves propagation. 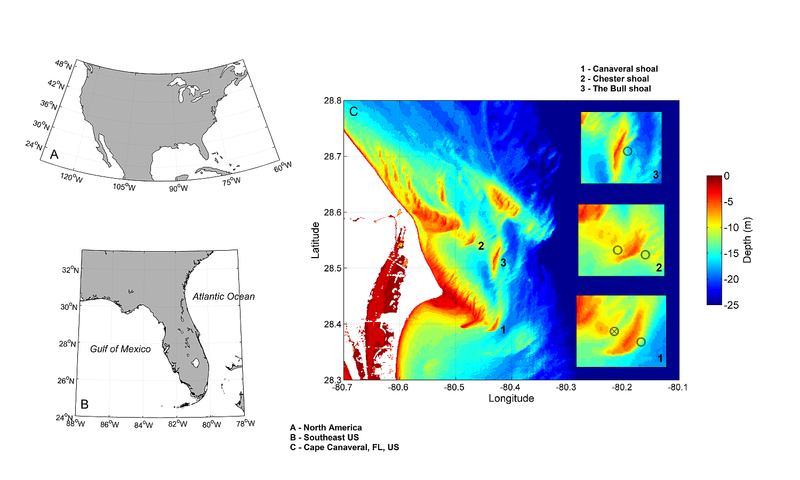 Cape Canaveral shoal complex is located in the Atlantic inner-continental shelf of Florida, centered at 28.5° N, 80.5° W. The presence of ridge-swale features provides irregularity to its bottom morphology. Typically, these shoals lie at depths between 5 and 25 m. Shore-connected Canaveral (aka Southeast Shoal) and Chester shoals extend from Cape Canaveral and False Cape, respectively. Isolated shoals are present at the inner-shelf seaward of the aforementioned shore-connected shoals, separated from those by shallow basins ~20 m depth. From those, Canaveral II shoal is located ~2 km from aforementioned Canaveral shoal, whilst The Bull shoal is located ~6 km offshore from the most seaward feature of Chester shoal. Three different models of acoustic Doppler current profilers (ADCPs) were deployed at Canaveral II, Chester and The Bull shoals. A 1 MHz Nortek Acoustic Waves and Currents (AWAC) ADCP with a recording range of ~30 m was moored at Canaveral II swale east (28° 23.640'N, 80° 25.418'W) pointing upward. Its position was near the slope break offshore the ridge that is considered as the top of Canaveral II shoal under ~13 m depth. The instrument was deployed on a frame at a mean depth of 11 m from September 23, 2013 (day 266) to December 2, 2013 (day 336). Data were collected in 0.5-m cells using two different schemes. "Waves" data were recorded in bursts of 2,048 samples at 2 Hz (~17 min) separated by 1,920 sec (~32 min). "Currents" data were recorded as 60 sec averages separated by 240 sec (4 min). A second upward-looking ADCP (a Sidelooking Nortek Aquadopp Profiler), operating at a frequency of 2 MHz and a nominal range of 10 m, was deployed at Canaveral swale west (28° 23.988'N, 80° 26.333'W) under ~14 m of water. Data were recorded from September 23, 2013 (day 266) to December 5, 2013 (day 339) in cells of 0.5 m using a "currents" scheme of 60 sec averages each 300 sec (5 min) and a "waves" scheme of bursts of 1,200 samples at 2 Hz (10 min) separated by 3,600 sec (1 hour). Finally, the AWAC and Aquadopp were moored again during fall 2014 at Canaveral swale east (28° 23.645'N, 80° 25.442'W), and Chester swale west (28° 32.882'N, 80° 28.951'W), respectively. Both instruments used the same sampling configuration. Waves were measured in bursts of 2,400 samples at 2 Hz (20 min) and currents in 60 sec averages separated by 180 sec (3 min). At Canaveral swale east, the instrument operated at 1 MHz with a nominal range of 30 m. It was deployed under ~13 m depth from October 7, 2014 (day 280) to January 7, 2015 (day 372). On the other hand, the ADCP moored at Chester swale west operated at 2 MHz with a nominal range of 10 m under ~12 m of water from October 7, 2014 (day 280) to November 20, 2014 (day 324). Paniagua-Arroyave JF, Adams PN, Valle-Levinson A, Parra SM; Tidal Variability of Infragravity Waves Over Cape-Associated Shoals. Abstract #66555, submitted for AGU Fall Meeting 2015.